eSamikSha web portal developed and managed by Cabinet Secretariat Informatics Division and adopted by various Ministries/Departments/States/Districts/PSU etc. 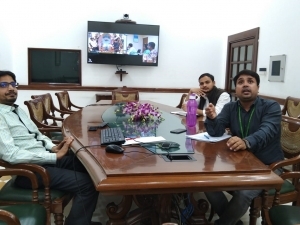 for their issue resolution and compliance on 20th November 2018 in the Training programme organized by Ordnance Factories Institute of Learning Avadi, Chennai (Institute under Department of Defence Production, Ministry of Defence, Government of India) on "Government Initiatives on Digital India”, via Video Conferencing. eSamikSha, an online Monitoring and Compliance Mechanism has been developed by Cabinet Secretariat Informatics Division, to fast track the compliance of pending action points, proposal, targets, etc. of Various Ministry/Department/Organization/Agency of Govt. of India and Government of States and UTs. The Portal has been designed in such a way that it will enhance efficiency, bring transparency, reduce the need of protracted correspondence and improve the communication between Government to Government (G2G). This system can also be configured to review/monitor the follow up action in respect of meetings/projects/issues/schemes, if required. 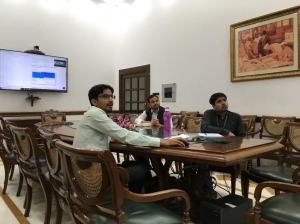 Session was started with a brief description about the eSamikSha by Shri Yogesh Kumar Agarwal, Scientist ‘B’ of the Cabinet Secretariat Informatics Division, followed by audio/visual presentation. During the training all the modules of eSamikSha were explained in detail. Later a demonstration of eSamikSha was given to the participants. It was also explained that how eSamikSha fulfills the needs of Government Organizations and also how they can use eSamikSha in their organization to monitor important decisions/action-points. Session was attended by more than 30 officials from various regional ordinance factories located across the country. The session was ended with the question & answer session and vote of thanks.